David Chang-backed delivery service Maple is growing, expanding, and most importantly, is expanding its chef takeover program. The service is, in many ways, excellent. It provides lunch and dinner for $12 and $15 respectfully, which includes tax, tip and delivery charge. The menu items are also things you’d want to eat every day and could without completely ruining any semblance of a healthy diet. The idea is that food is cooked in many different kitchens so that it never has to go far to get to you, and every time we’ve used it, it’s always come warm and doesn’t look mangled like delivery sometimes does (no random sauce all over the bag). The one thing is that the food has so far been pretty average. 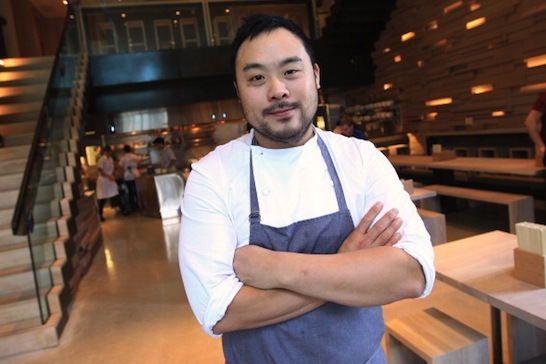 It’s been missing David Chang and great cooking in general. About a month ago, that changed. He and Christina Tosi of Momofuku Milk Bar created the menu for a week, which led to praise and publicity. They’re not stopping there. Next week, Dan Kluger will be taking over Maple’s delivery menu, and from February 22-March 4, you’ll be able to eat limited edition menu items created by him. Kluger is a New York City based chef with an impressive resume that includes stints at Union Square Cafe, ABC Kitchen, and ABC Cocina. He won a James Beard Award in 2011 and was nominated for another one in 2014. In 2012, he was named Best New Chef by Food & Wine Magazine. A portion of the proceeds will also go to Cookies for Kids’ Cancer, an incredible organization that provides research grants to pediatric cancer centers to advance the development of less toxic, more effective treatments for children battling cancer. The organization started with simple bake sales, and has grown since it was founded in 2008 and now has events all over the country. The potential donation for these proceeds is up to $10,000, so not only will you be eating delicious food, but you’ll be supporting an important cause. We’re looking forward to trying Kluger’s menu. Starting on February 22, you can order it on Maple.